When a couple takes the wedding vows, they promise to be by the side of each other forever. But at times, unwanted situations and unfavorable circumstances force them to part ways and it’s better to do it legally with divorce forms. 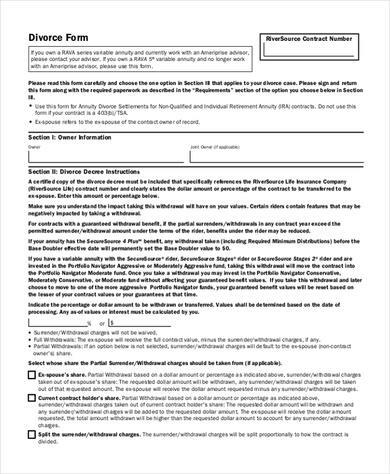 These forms clearly specify that the couple wants a divorce and also note down how the assets would be divided and who would get the child custody. There are readymade divorce forms online catering to different kinds of divorces. 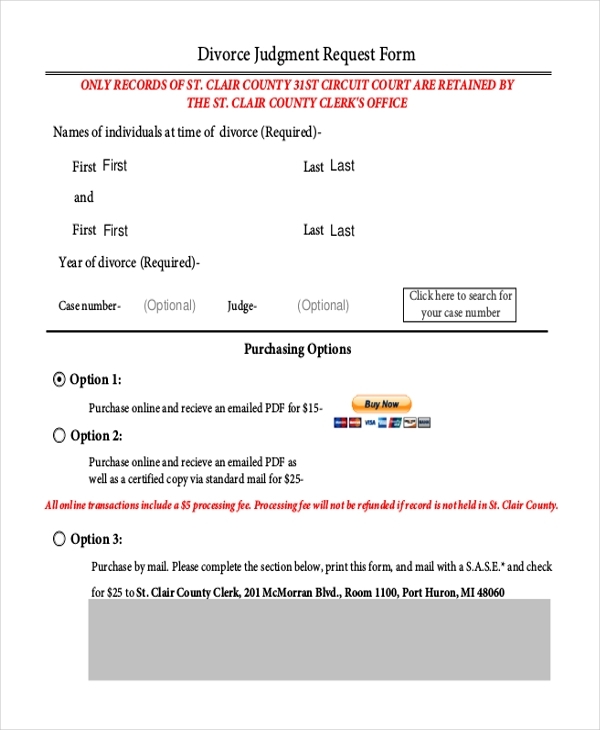 If you are looking for annuity divorce forms, this sample here is just the thing that you need. It comes with divorce decree instructions followed by an elaborate discussion on divorce options. 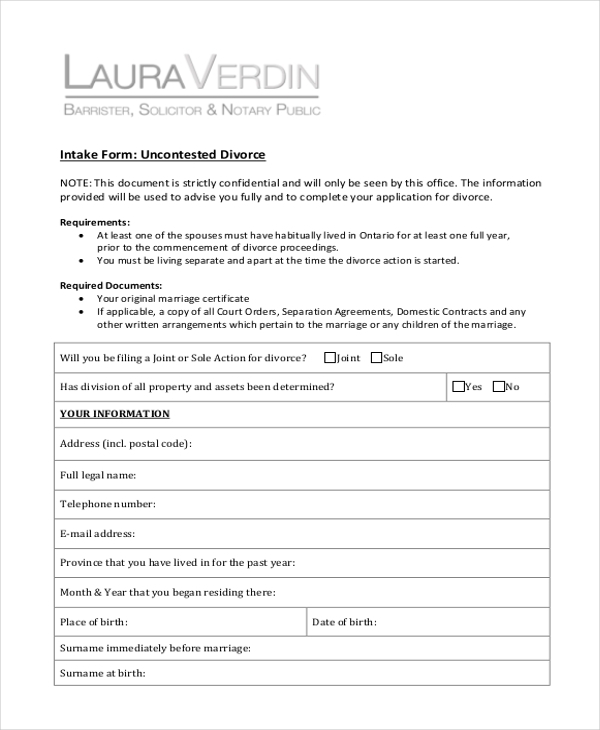 This uncontested divorce form starts with requirements to fill the fill the form required documents, followed by information on the person filing the divorce as well as details of his or her current spouse. You have an elaborate divorce application form that begins with information of the application, followed details on both husband and wife, jurisdiction, marriage and separation and ends with lawyer’s declaration. 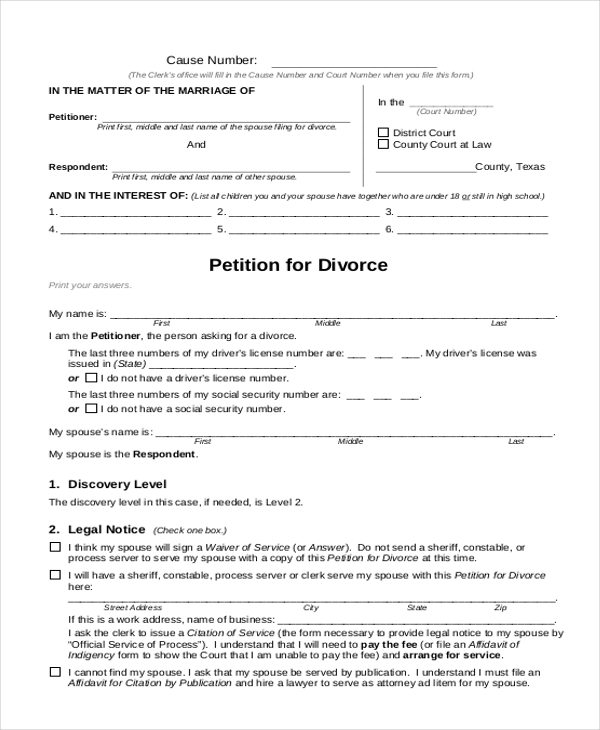 You have a standard divorce petition form here that begins with identifying petitioner and respondent, their children and then goes on to include all major sections of such a form. 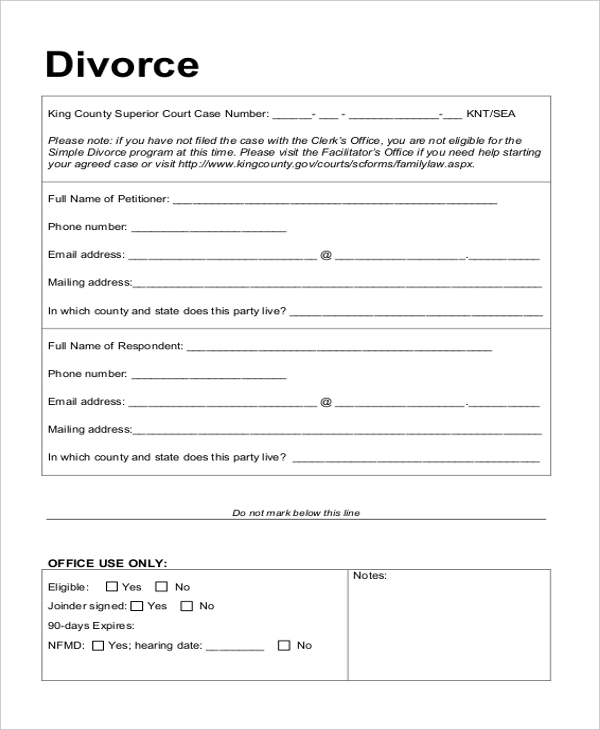 This divorce decree form would be useful for divorcing couples with no children. It mentions the date of hearing and then covers other major sections like appearances, record, jurisdiction, divorce etc. 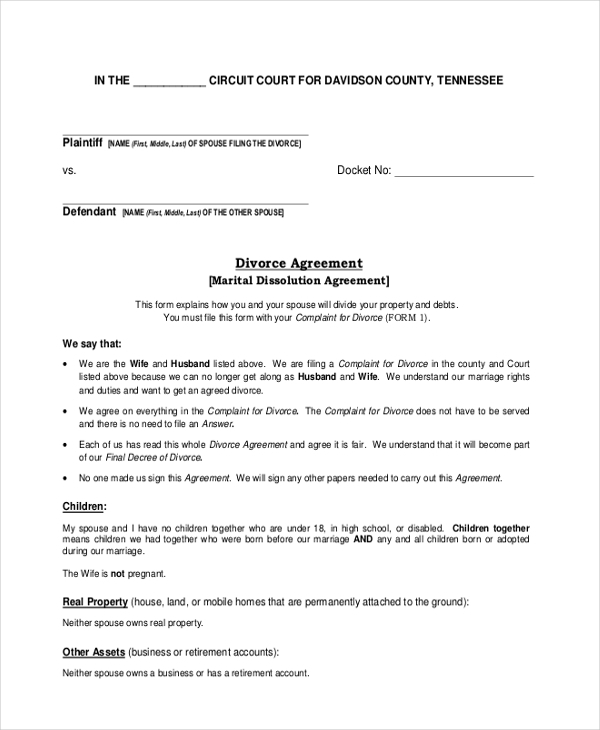 If you need court divorce forms, here is a standard sample for you which begins with what the respondent agrees to in regards to the divorce petition of the petitioner. This divorce notification would be applicable to GEPF members and you have a detailed form here with all the needed sections, such as member’s personal details, employment details, certification by employer representatives etc. If you need advice on filing for divorce, this sample here would be handy with its detailed instruction on what to know while applying for divorce or separation, legal issues to keep in mind and so on. 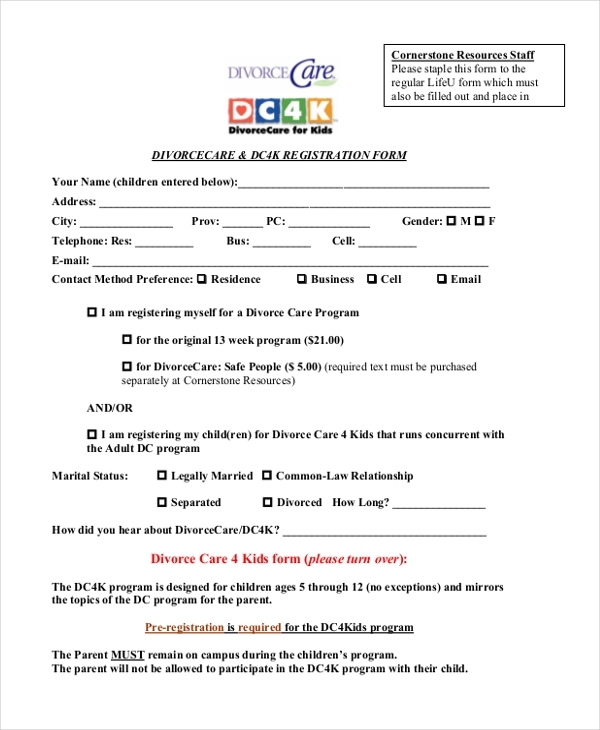 The form here would be useful for those parents who are about to apply for adult and child divorce care programs with kids. The form will include elaborate information on your child. The form would be useful for divorce separation cases without children and includes divorce questionnaire, disclosure form, case information as well as other major aspects regarding applying for a divorce. The divorce form here would be useful when the divorcing couple has to divide their debts as well as property in between themselves. 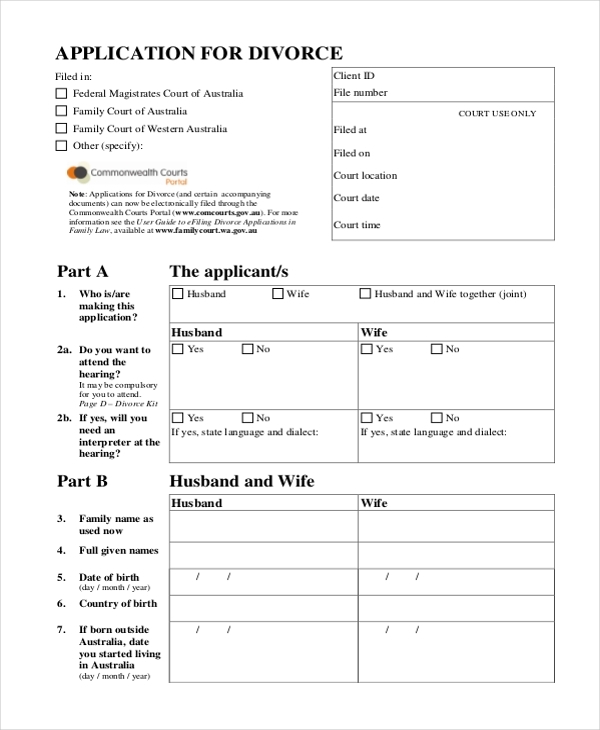 This form would be good for spouses with no children. You have an elaborate divorce application form here which can be filed by any of the spouses or by both jointly. 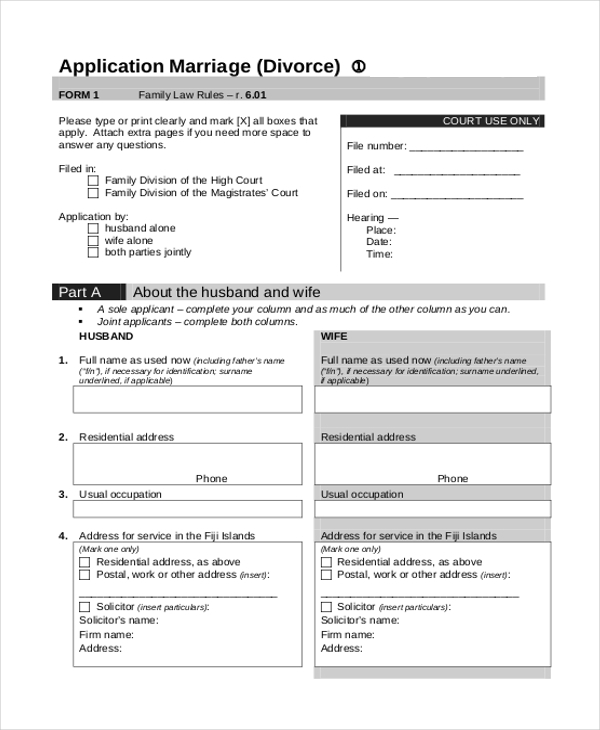 The form covers information on both the spouses, the marriage, break-down of the marriage and reconciliation and so on. The document here serves as the final consent order regarding the divorce judgment from the court and details on the rights and duties to be followed by the divorced parties. 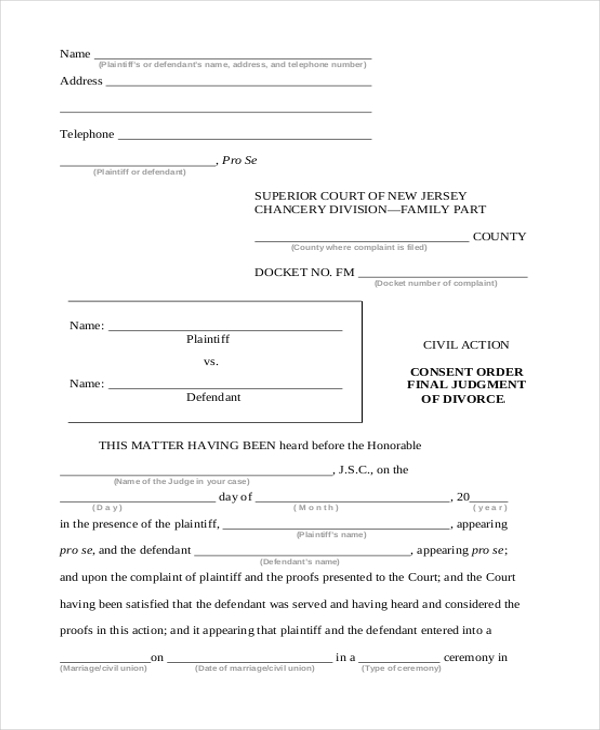 You have a professional divorce judgment request form here which can be purchased online. The first half of the form is about the personal details of the divorcing couples while the latter half discusses the purchase options. The document would help you with a statement of claim for your divorce and includes all the needed sections pertaining to the claim, covering the parties, residence, grounds, children, reconciliation, employment and so on. 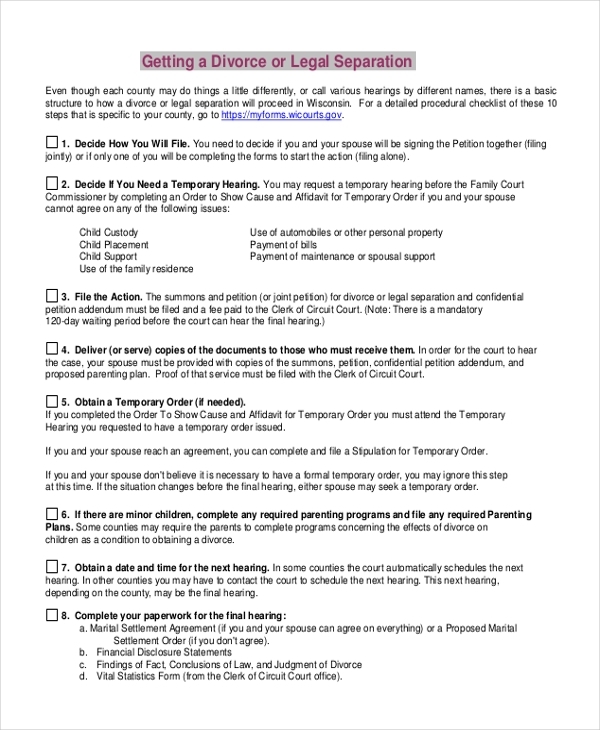 What are The Different Types of Divorce Forms? 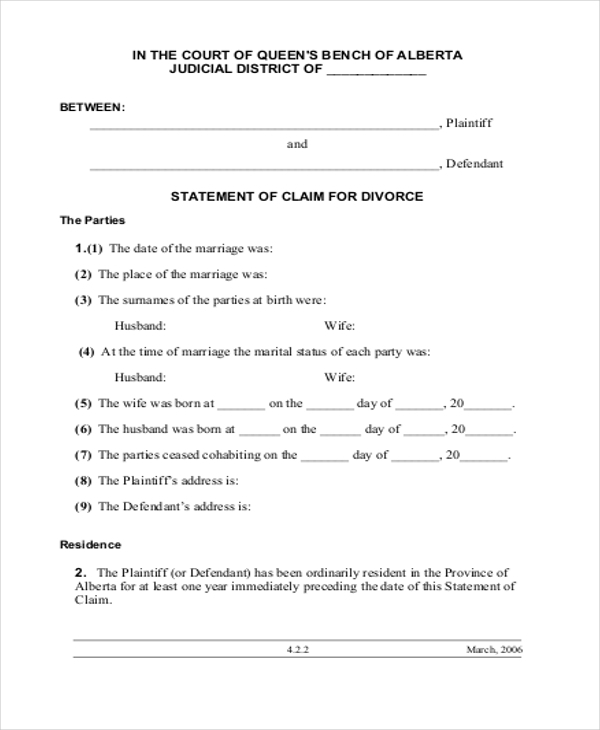 There are mainly four types of divorce forms, depending on the type of divorce. First, you have no-contest divorce form where the couples agree to part ways citing incompatibility and none of them accuses the other of any fault. Then, you have uncontested divorce form where both the spouses mutually decide to divorce one another. Another one is simplified divorce form which is a combination of the above two and mostly applies to short-term marriage with no kids and no such elaborate joint assets. You also have limited divorce form that is somewhat akin to legal separation. 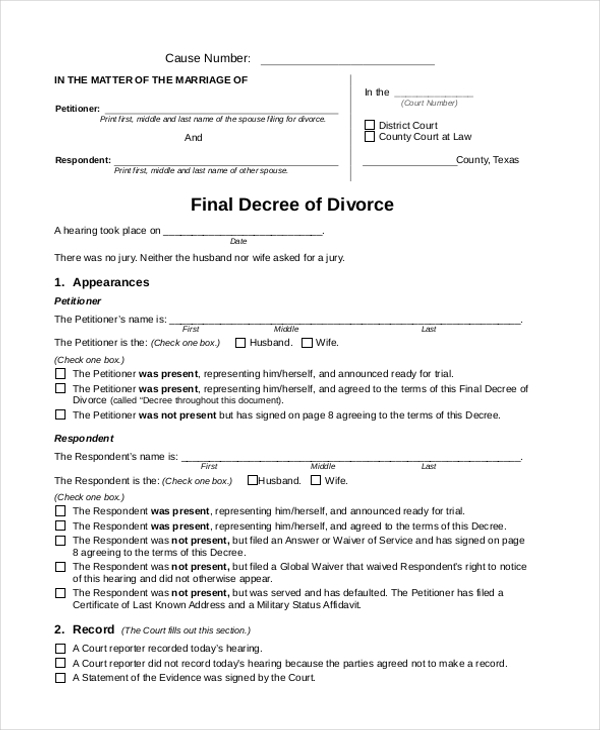 What Do Divorce Forms Look Like? The divorce forms usually include the name of the applicant or petitioner applying for the divorce and the name of the respondent, i.e., the other spouse- who will oblige to the petition. The form would specify the terms and conditions to be maintained by both parties, regarding the assets, child custody, access to child and so on. Some of the forms also include information of the current spouse of the petitioner and details of the kids. There are special annuity divorce forms as well to clarify the share of financial assets in between the couple. If you wish to have an idea on the standard divorce forms would be the thing for you. All of them are drafted by experts and come with a professional ready-made and customizable format so that one doesn’t have to draft the whole form from scratch. 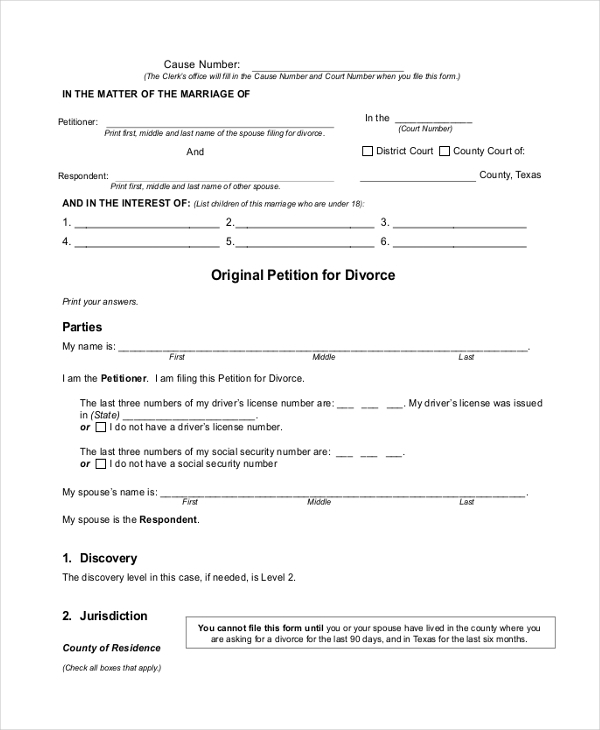 You will get a versatile range of divorce form templates here.